Merry Christmas and best wishes for the New Year! Due to our Intro to Beekeeping class being held next month, our next regular meeting will be held on February 20, 2017 at 6:30 p.m. We would like to remind anyone who plans on attending the class on January 7th to kindly pre-register if you haven't already. See additional details below. The class has been revamped this year to one day and focuses on the best methods for keeping bees in our climate. 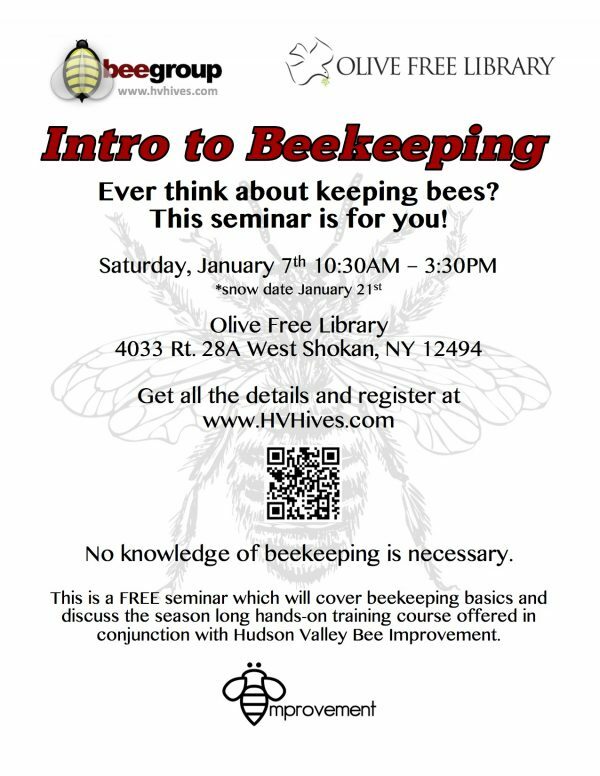 Hudson Valley Hives is a beekeeping group that meets at the Olive Free Library on a monthly basis and discuss all things beekeeping. It is very informal and we welcome anyone interested to participate. If you are just thinking about getting started in beekeeping, a new beekeeper, or a seasoned beekeeper, you will benefit from the group discussions.